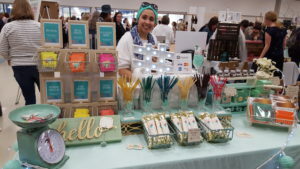 It was a gorgeous Saturday afternoon in Waterloo Region, and 79 talented Etsy makers have gathered at RIM park for the Etsy: Made in Canada event. Handmade enthusiasts descended upon the arena, and filled each aisle of the intimate rooms overlooking the rinks at RIM Park Arenas. 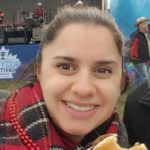 Last year we attended the same event in downtown Toronto at the MARs Discovery Center, and were excited at what the Tri-Cities would bring to the table. We were not disappointed. Load of parking, no line-up, and even an awesome selection of door prizes (with purchase of items from any 3 vendors at the event). If you missed it, I’ll be reviewing some of the highlights with you in this Discover story. 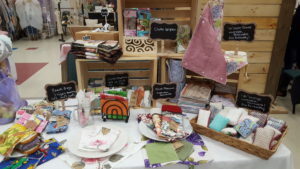 We will let you know which were our Fav makers, which were must have items for us (must buy), and some honorable mentions that unfortunately were only available at the show and won’t be found in their online Etsy shop. 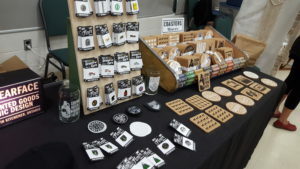 We should note, that as with shows like One of a Kind, often makers will focus on having enough supply for the show, and may have limited in their online shop for a period before and after. Please be sure to bookmark the shop links you like from the list below, and check back often or message the shop owner direct if you can’t find what you are looking for. I am a bit of a honey addict, and I cannot resist scooping up and popping open a delicious honey stick / straw when I come across them. So you better believe I grabbed a handful of locally sourced honey from Mint ‘n Mix while at the show. They are the perfect compliment to her amazing selection of teas, including cocktail flavours just in time for patio weather. We are always looking for great “men” driven product while out at these shows, and while I would say the designs from BearFace can definitely be defined as unisex, I would say that any guy out there would have been drawn to this makers wares. From the beer themed glassware, to cork coasters and graphic Ts, I thought of a number of guys in my life who would’ve loved them all. 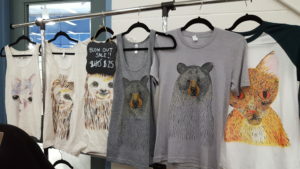 Had to buy, what I am calling my “mama bear” tank, just in time for Mother’s Day. Happy 2nd Mother’s Day to myself, sometimes you just have to treat yourself. The tank fit perfectly, nice length, very soft, and of course we checked to make sure it was in fact made in North America. Originally known as ATTACK! Collective, this maker is in the process of changing her brand over, but the artwork and quality of her goods remains awesome. Having a little G-team kiddo at home, we are often drawn to the toddler clothes. 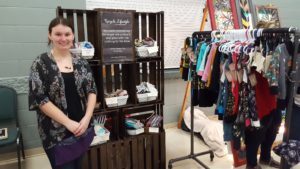 We stopped by the Upcycle Lifestyle booth because we spotted a collection of sweet looking hoodie style shirts, and grow with me pants that are all the rage, and the fabrics the maker had used were unique. I would say again unisex type options, and the great thing is that she uses her ends and cuttings to make other products for her shop so there is almost no waste. Fell instantly in-love with the super soft and adorable patterns of the Grow with me pants. Couldn’t resist the paw patrol pair for my little guy. Was wishing that there were adult versions for me to get too, would love a matching pair so my son and I can be twinning. The stretchy fold down waste band reminded me of my gloriously comfortable maternity pants, so yes I was jealous. Now we aren’t sure that the fabrics are North American here, but Melissa is for sure a hard working maker right here in Canada, making awesome goods (including fun undies for Mom!). If you are a drinking family, like us, you too would have made a stop at the Mirela Wood Design booth. 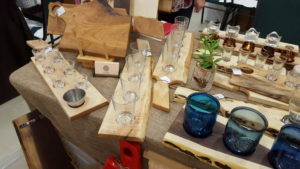 Their display of paddles (flights) and serving trays made from gorgeous live edge and stained wood caught our attention. Everything from tequila shot tray, to Jagger-bomb trays, perfect for any home. We were told that they may not be found in their shop, just made for the show, but I spotted one on there the other day, so check back or contact them direct if you love what you see. First drawn to this vendors booth by her clever and sassy sayings on her printed canvas pillows, including one perfect zinger on a cactus print pillow “don’t be a prick”. Would have loved it in my home, unfortunately for me, my couch already over flows with pillows. We did end up finding an adorable matching set of emoji print bandannas for our dog and little guy, which I know will make a great couple of pictures and a hilarious memory for when he gets older. 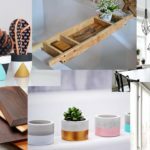 If you are looking to give your home a bit of attitude, check this shop out. Every time we go to the grocery store lately to buy more produce, we have noticed other smart people making use of reusable produce bags. So we were hoping to find some at the EtsyWR event, and we finally did when we came across Upcycled Creations. This maker upcycles old pillow cases, curtains etc. to make new products including reusable produce bags (S, M, L sizes) so we had to snap up a few for ourselves to start making a difference in our plastic use. 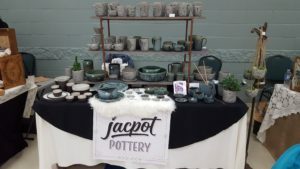 Jacpot Pottery: Fresh take on ceramics, not overly “modernized”, we loved the use of natural bark type patterns, and choice of colours in the mugs and knitting bowls. De-Liz-cious Treats: These folks were serving up awesome spicy fudge, toffee, caramel and chocolate covered pretzels. Need we say more, drool. Bailiwick Studios: Super on-trend right now, this maker had funky air planters made from various animal figurines, dinosaurs, lions, and bears oh my. Butterpot Designs: For those who are travelers, or those who are winery tour fans, the team behind Butterpot Designs makes wonderful canvas and cork maps, and then hand makes the most adorable custom push pins to mark where you have been. For example tiny airplanes, tiny sunglasses, and tiny wine glasses, all made by hand.